Upcoming new Tollywood Bengali film Gosain Baganer Bhoot movie story review castings director producer actors actresses Gosain Baganer Bhoot release dates book buy tickets online Bengali Gosain Baganer Bhoot Victor Banerjee. Photos pictures wallpapers download mp3 songs Gosain Baganer Bhoot Victor Banerjee. New Bengali movie review plot shooting location cinema halls showing Gosain Baganer Bhoot kolkata hooghly howrah Bengal show timings upcoming hit Bengali cinema Gosain Baganer Bhoot details information. After a long time, an interesting Bengali Movie has been created for the Kids. Techno India Group, V3G Films & Mou Roy Chowdhury presents under the direction of Bengali Filmmaker Nitish Roy ‘Gosain Baganer Bhoot Bengali Film’, which is a story of little child with the power of doing miracles. • Gosain Baganer Bhoot Bengali movie Director name: Nitish Roy. • Gosain Baganer Bhoot Bengali movie Producer name: Mou Roy Chowdhury & V3G Films. • Gosain Baganer Bhoot Bengali movie Story Writer name: Sirshendu Mukhopadhyay. • Gosain Baganer Bhoot Bengali movie Music Director Name: Chandrabindu. • Gosain Baganer Bhoot Bengali film Casts Actors Actresses: Victor Banerjee, Tinnu Anand, Asish Bidyarthi, Kanchan Mallick, Kharaj Mukherjee and many others. • Gosain Baganer Bhoot Bengali movie Release Date: 9th December 2011. • Gosain Baganer Bhoot Bengali movie Story Review: A small boy named Burun did all impossible things and surprised the whole area of his living place. Barun does this miracles by himself with a wee bit of help from Nidhiram, is a ghost. Yes, A friendly ghost from the deep jungle of Gosainbagan. When Burun got only thirteen marks for mathematics in his final exam he was completely heartbroken. Life became very difficult for him after that because his parents became awfully strict. So one day he ran away to the Gosainbagan jungle. There he met Nidhiram the Ghost – who soon became Nidhi Da for Barun and life became more and more entertaining. But what happened in reality that you must see in Movie Theatres. 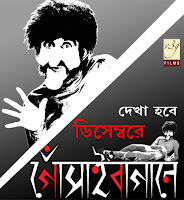 • Cinema Halls showing Gosain Baganer Bhoot Bengali movie:Priya, Prachi, Metro, Star Theatre, Mitra, Jaya (Lake Town & Barasat City Mall), Ajanta, Ashoka, Malancha, Mahua (Garia) Cinema Halls showing Gosain Baganer Bhoot Bengali Film, Inox (city Centre, Swabhumi, Rajarhat, Liluah, Bardhaman, Durgapur, Siliguri), Fame Multiplex (South City / Hiland Park), London Parris Mukti World (Ballygunge), Salt Lake Broadway Movie Theatre in Kolkata Cinema Halls showing Gosain Baganer Bhoot Bengali Film, Srirampur Talkies, Chuchura Rupali, Bolpur Gitanjali, Balurghat Satyajit Mancha, Bioscopre Axis Mall (Rajarhat) and many other Cinema Halls in West Bengal. Tollywood film Gosain Baganer Bhoot of Victor Banerjee & Others., upcoming new Bengali movie, seems to be worth watching in Cinema Halls; so start buy tickets online of Gosain Baganer Bhoot from www.bookmyshow.com website.